When it comes to controlling inventory costs, Easy Rack forklift attachments are the construction manager’s best friend. They save thousands of dollars on heavy equipment procurement by allowing companies to a small number of forklifts and use them for a much larger number of applications. Simply by adding the right attachment, a crew can do anything from elevating materials and workers to loading materials into containers. The success of our forklift attachment line is evident by the fact that many people select an attachment specific to an application, and then select a skid-steer or forklift to go with the attachment. This allows for a higher level of customization, ergonomics, safety, and process flow efficiency, because each attachment has already been designed to make a forklift perform a specialized task within the boundaries of OSHA regulations. can reach up and over obstructions that prohibit the use of scissor lifts. They provide a safer, larger, and more stable work platform than boom lifts and can be elevated to the desired height much faster than a scaffold. These forklift attachments are designed with OSHA compliance foremost in mind, and feature toe boards, full perimeter guardrails, and secure access gates. Optional mast protection screens can also be installed to protect workers from the moving parts of the forklift mast. Because forklifts are often much more powerful than their forks, their full weight capacity often goes untapped. 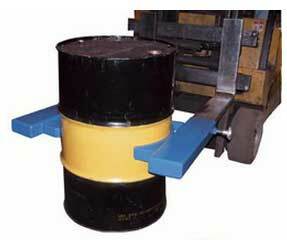 Lift hooks allow companies to tap into this unused potential and use the full power of their forklifts. These attachments secure toward the base of the forks and allow the forklift to safely and easily lift up to 10,000 pounds. 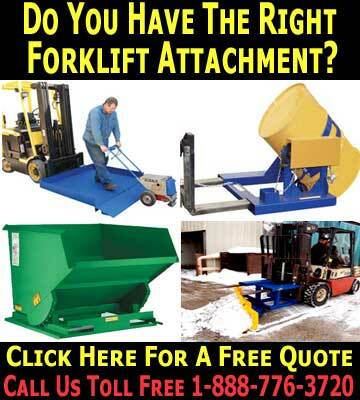 These attachments can be used with both straight-mast and extendable reach forklifts. Construction cleanup is a vital part of construction site safety, but it doesn’t require a fleet of dump trucks to do effectively. Self-dumping hoppers attached to forklifts can load and carry debris and garbage to dumpsters. Built for rough terrain, these hoppers can release debris from an elevated location when discharged, saving time and reducing the risk of collisions with the dumpster in the process. 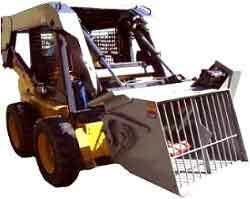 Self dump buckets are forklift attachments that work in a similar fashion, but their purpose is not to discard debris, but to load dirt and other materials into trucks. Perhaps one of the most efficient money saving forklift attachments construction companies can invest in is the quick-tach truss boom. It operates exactly like a crane, at a much lower cost. It is ideal for work in low-rise jobs, especially metal and portable building erection. Heavy duty applications can be tackled with the Easy Rack heavy duty jib. Made for moving heavy items in and out of hard to reach places, this jib can reach over or under obstructions and scaffolding, and it can go through narrow openings like windows. 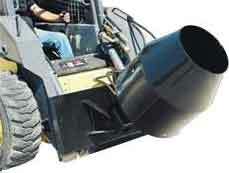 Its maneuverability also makes it much easier to load and unload trucks more safely. A number of other forklift attachments can also be obtained in either new or used condition through your material handling specialist. Be sure to ask about lift buckets, replacement forks, fork extensions, and ram poles, or visit our product listing here to find examples of heavy construction equipment which our experts can customize for specific applications. Easy Rack carries a wide variety of used pallet racks, commercial shelving, material handling equipment, and modular prefab buildings installed nationwide. If you can not find what you are looking for call us toll free at 1-888-776-3720 and we will find it for you. Our home office is located in Houston, Texas with warehouses located throughout the United States that enable us to service all 50 states including New York NY, Los Angeles CA, Miami, FL. Chicago, IL. Denver CO., New Orleans, La., Cleveland, Ohio, Kansas City, Mo., Mesa, Arizona, Virginia Beach, Va., Omaha, Nebraska.